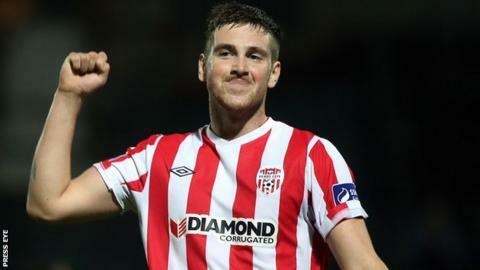 Derry City shook off their current league struggles as they impressively defeated Drogheda United 3-0 to progress to the FAI Cup quarter-finals. Mark Timlin squandered a early Derry chance but they did take the lead on 16 minutes as Cillian Morrison's cross was glanced to the net by Patrick McEleney. After Timlin hit the Drogheda woodwork, Derry doubled the lead on 65 as Morrison netted from close range. Barry McNamee hit Derry's third goal two minutes later with a low shot. Timlin should have put Derry ahead in the second minutes after being put through by the superb McEleney but the Buncrana man delayed his shot which allowed Drogheda keeper Michael Schlingermann to spread himself to save. However, Derry continued to produce all their pressure in front of an attendance of less than 900 spectators and they took the lead on 16 minutes as Morrison's pinpoint crossed was glanced to the net by McEleney. The two men combined effectively for the Candystripes throughout the contest with Morrison edging out his team-mate for the man of the match award. Timlin rattled the Drogheda post before the break and Schlingermann had to make two great saves to deny Morrison shortly after the restart. But Derry were in firm control as Morrison poked home from close range on 65 after the Drogheda keeper had saved McEleney's thumping free-kick. McNamee added the third goal two minutes later with a low shot from 25 yards after a Timlin run had been halted.